We are a small but dedicated group of musicians, engineers, designers and tech lovers building something we love. The idea for ACPAD is born when Berlin musician Robin Sukroso needed a device that would allow him to bring his love of both electronic and acoustic music together. Robin first began experimenting in 2009 by building his own devices. With the help of a friend, he heavily altered his guitar - drilling holes and running cables through it - which finally let him perform the music he had envisioned. Robin’s original style of music got him to perform with his prototype guitar in different places around the world. 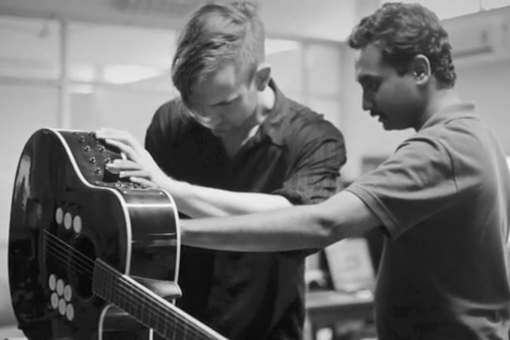 It was in India, after his guitar and prototype was accidentally damaged that he met Amaldev, Deepak and Avinash, three graduate students from the Indian Institute of Technology in Mumbai,India’s top engineering institute. What first began as a repair mission soon led to the development of something much more ambitious... a mountable, wireless and super thin MIDI controller for guitar. This was the birth of the ACPAD vision. After almost 3 years of research, development and prototyping, ACPAD had a successful crowdfunding campaign on Kickstarter, raising more than 6 times its original funding goal. Since then, we have been selling our product to customers in 75+ countries worldwide. © 2019 ACPAD Instruments GmbH. All Rights Reserved.